Community Outreach - GeoWing Mapping Inc.
One of the widest applications for drone use is for Geographic Information Systems (GIS) and remote sensing. Drones are quickly changing the geographic industry, which is why it is so important to begin introducing this new technology in the classroom. GeoWing visited California State University, East Bay in Hayward, CA, to give a guest lecture on mapping with UAS. Geography students in the “Applications of GIS” class got to see a live drone demo and then work with the captured data. We wanted to give the students an “A to Z” mapping experience, through acquiring the images to processing them later in class. ​We started the lecture by flying a short drone mission with a DJI Phantom 3. 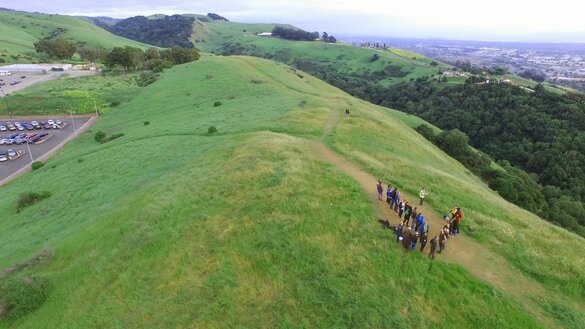 The class was captivated by the ease of acquiring data, and even took advantage of this opportunity to take an aerial photo of the group arranged in the shape of an arrow (as seen below). It was great to see such enthusiasm from the students, many of which had never seen a drone fly before. ​We were very fortunate to teach such an engaged group of students and want to thank Dr. Kerry Rohrmeier for inviting us to come speak to her class. As this new technology becomes a staple tool in the geographic industry we anticipate that UAS will soon be integrated into the GIS and remote sensing curriculum. Until then, we hope to have more opportunities like this one to share our knowledge and passion for UAS!